A woman from our church brought the most amazing chocolate truffles to our recent Luau. Matt and I just couldn't stop talking about them. Finally we decided to do something about it and searched online for a recipe to try. I found some that were simple enough and tweaked them a bit to get these. In a large bowl, beat cream cheese until smooth. Gradually beat in confectioners' sugar until well blended. Meanwhile, melt 2 cups of the chips over low heat. Stir in melted chocolate and vanilla until no streaks remain. Refrigerate for about 1 hour. Shape into 1 inch balls. Put in the fridge for 20 minutes to firm up. 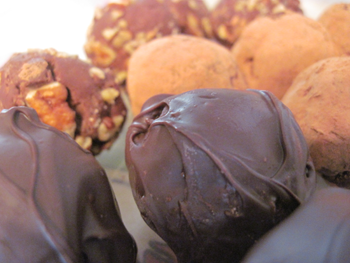 Melt the other 1 cup of chocolate and dip truffles. 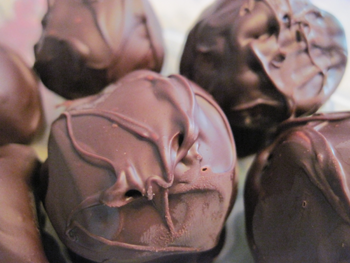 Put them in the fridge for another 10 minutes or until chocolate sets. 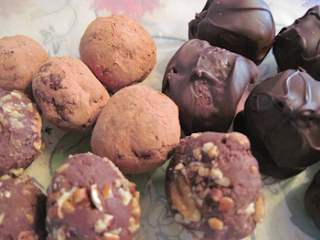 They were super easy to make, used VERY few ingredients, taste AMAZING, and yielded about 60 truffles! Including rolling and chilling time, I think it was less than two hours from start to finish. These are great for the holidays...maybe I'll have more family coming out to visit...my sister Hallie and my Mom are die-hard dark chocolate lovers. Gotta Go! Truffles are calling!